Santorini is a place of both natural and man-made beauty, and we wanted to explore every corner. A private tour let us see all the sights hassle free. 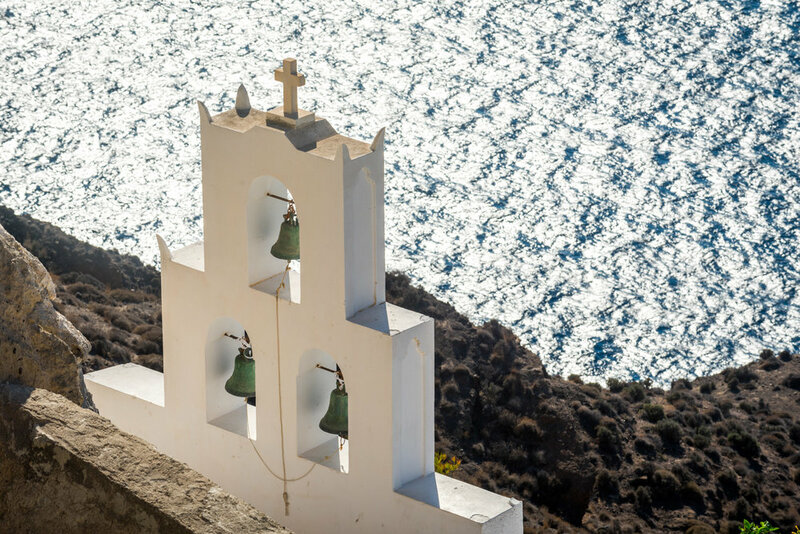 From the history, to the beaches, to the cobblestone alleys and everything in between, there is just so much to see in Santorini…and we wanted to see it all! Some of the sights, such as the volcano or the beaches, are best viewed from the water. Others however, can be found inland. Having spent an awesome day cruising around the bay of Santorini with Omega Travel, we used the same company to continue our adventure by car. Santorini -- while not a huge island -- can be a difficult place to explore alone. You really need a car, as the sights are spread out, and the distances between them are too big to walk unless you are an avid hiker. It is possible to rent cars or ATV’s on the island but this involves all the hassle of paperwork and the constant fear of navigating Greek roads. A private tour on the other hand, seemed a convenient way to see it all. So after our Catamaran tour around Santorini, we met our guide and driver and were on our way! We decided to go with a private guided tour, because they’re just easier! You don't have to “make friends,” you can go at your own speed and see what you want. After a quick chat with our guide, we made our way slowly up the winding road and headed to a traditional village…and no I don't mean Oia or Fira. This beautiful village really was classic Santorini. With mazes of narrow cobblestone streets, white walls, colorful doors, quaint cafes, and century old churches, it felt like we were seeing something really special, that wasn’t in many guide books. After our village tour, we drove a short distance to the cliffs near the chapel of Agios Nikolaus. We followed along a footpath, picking our way through the rocks and down to the bottom of the cliffs. Along the way, we came across a natural rock formation that the locals call the ‘Love Heart’. It is easy to see why – a large heart shaped hole has formed, cutting right through the rock face. It is a romantic spot, and by the looks of things, someone had recently taken advantage of it to propose! ‘Will you marry me?’ was painted onto four stones in front of the heart. Our first glimpse of the chapel came when we saw its three bells sticking out over the rocks set against the backdrop of the sea. I still can’t believe we were the only people around this area. We admired the views for a while before heading back up to the car. All that walking had made us thirsty so our next stop was a wine tasting. This took place at a local winery, which also acts as an art gallery, called Artspace. The gallery is in one of the many whitewashed historic buildings that make Santorini so charming. Before being repurposed, it used to be winery and so the gallery space extends down into an underground cellar which was used to store the fermenting barrels of wine. Today the wine is made in a nearby building and, after admiring the paintings, we sat down to try their creations. It was excellent and just what we needed after a day in the hot Greek sun. As we enjoyed our drinks, the sun was starting to fade so we hopped back into the car and took a quick trip to Fira, whose west facing location makes it one of the best places on the island to watch the sunset. Our guides led us through the maze of streets, so that we could find the best views away from the crowds. The day’s trip as a whole had given us our best photos of the island, but the photos we got here were some of our favorites. Just as they had on our catamaran cruise, Omega Travel had given us another magical experience. Our guides were all excellent, knowledgable and they were all fluent in English. One of the best things about the tour was that, not only was it private, but we hardly came across any other tourists at the places we visited. It was like we had the place to ourselves. If you are ever in Santorini, check Omega out – they offer a variety of trips and you can see them all on their website. All in all, this trip was a great way to see the island. It allowed us to visit places which we wouldn’t otherwise have been able to get to and, thanks to our guide’s local knowledge, we visited some places we didn't even know existed. By the time we were dropped off back at our apartment, we were satisfied that we had seen much of what Santorini has to offer.